Tribus Aser id est, portio illa Terrae Sancta, quae Tribui Aser in diuisione regionis attributa fuit. 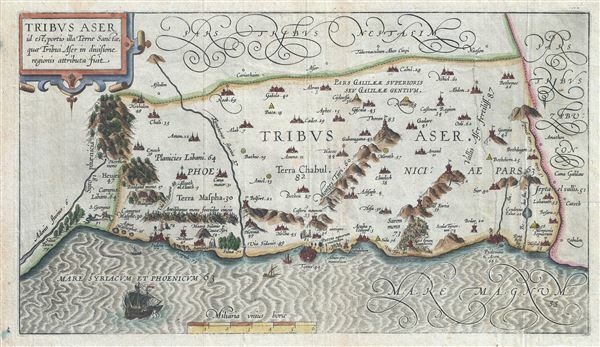 This is a beautiful example of Christian van Adrichom's rare 1590 map of the lands granted to the Tribe of Asher at the time of Joshua's division of the Twelve Tribes. The map is oriented to the east and covers western Galilee from the city of Acre (called Ptolemais or Acon in ancient times) northward past the city of Tyre (Tyrus) toward Sidon and Mouth Hermon. A number of important biblical sites are identified pictorially including the site of the episode of Saint George and the Dragon where Saint George, the brave martyr, kills a dragon (signifying the devil) to rescue a princess (signifying God's Holy Truth). After the Kingdom of Israel was conquered by Assyria, the northern tribes including Dan, Ephraim, Manasseh, Asher and Zebulun were spared. The tribe of Asher would return to worship at the Temple of Jerusalem. This map is the first of ten maps of the Holy Land prepared by Christian van Adrichem for publication in his Theatrum Terrae Sanctae. Adrichem's maps for the Theatrum were prepared between 1580 and 1585, but were published posthumously by his associate, Gerardis Brunius of Koln, in 1590. The publication went through several later editions and served as a basis for most subsequent maps of the Holy Land well into the 18th century. Laor, E., Maps of the Holy Land: Cartobibliography of Printed Maps, 1475 - 1900, #9.